'[Prior-Palmer's] gorgeous, sensual depiction of this race is a literary marvel; it feels like you are riding alongside her across the desolate steppes; her verbal acuity makes vivid the most elusive of landscapes; her triumph becomes ours' NYLON The Mongol Derby is the world’s toughest horse race. A feat of endurance across the vast Mongolian plains once traversed by the people of Genghis Khan, competitors ride 25 horses across a distance of 1000km. Many riders don’t make it to the finish line. In 2013 Lara Prior-Palmer – nineteen, underprepared but seeking the great unknown – decided to enter the race. Driven by her own restlessness, stubbornness, and a lifelong love of horses, she raced for seven days through extreme heat and terrifying storms, catching a few hours of sleep where she could at the homes of nomadic families. Battling bouts of illness and dehydration, exhaustion and bruising falls, she found she had nothing to lose, and tore through the field with her motley crew of horses. In one of the Derby’s most unexpected results, she became the youngest-ever champion and the first woman to win the race. A tale of adventure, fortitude and poetry, Rough Magic is the extraordinary story of one young woman’s encounter with oblivion, and herself. 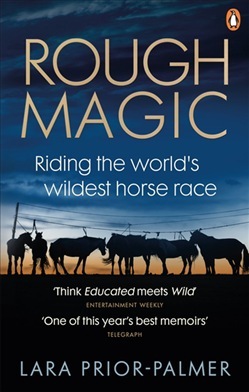 Acquista Rough Magic in Epub: dopo aver letto l’ebook Rough Magic di Lara Prior-Palmer ti invitiamo a lasciarci una Recensione qui sotto: sarà utile agli utenti che non abbiano ancora letto questo libro e che vogliano avere delle opinioni altrui. L’opinione su di un libro è molto soggettiva e per questo leggere eventuali recensioni negative non ci dovrà frenare dall’acquisto, anzi dovrà spingerci ad acquistare il libro in fretta per poter dire la nostra ed eventualmente smentire quanto commentato da altri, contribuendo ad arricchire più possibile i commenti e dare sempre più spunti di confronto al pubblico online.